The BellHawk software tracks labor time on work orders and jobs. It does this by scanning barcodes on employees badges whenever they start work and stop work on operations related to jobs or work orders. When an employee is working on multiple jobs at the same time, such as one person running jobs on multiple machines simultaneously, then that person's time is allocated across all those jobs. BellHawk can also track work performed by teams. Here people can join and leave teams dynamically and team leaders scan into and out of work orders and operations. BellHawk can record when people go on break and return from break and can record the time spent on overhead tasks such as training. 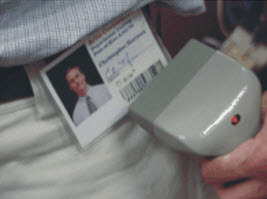 BellHawk can record when employees clock-in and when they clock-out using the same barcode scanner equipped PCs or mobile computers as they use for recording job activities. This avoids the time and expense in using time-clocks and enables workers to clock in and out wherever they are located. The time data collected by BellHawk can be exported to payroll and human resources management systems. It can also be exported to ERP systems as part of job costing activities.